Stainless steel instrument tray (with cover) used for storage or soaking instruments. 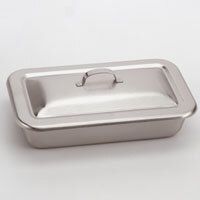 These trays are also great for tweezers and all facial instruments that need to be sanitized. Approximately 8"x2"x1" in size. Use in conjunction with item #703.